Remote setting, dramatic views, and a sleek, contemporary design. The Dovecote Range is everything you want in an oceanfront getaway. 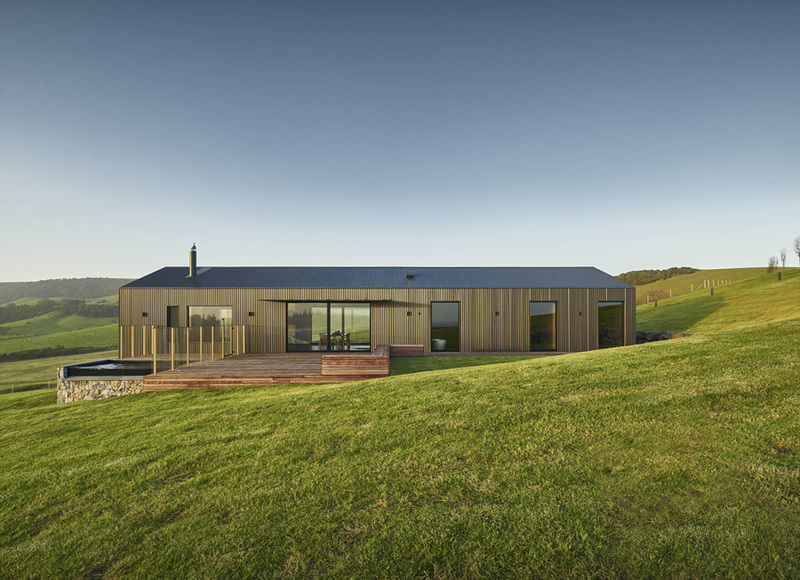 The steel cabin is sited on 150 rolling acres along the coast of Australia. A warm wood-lined interior houses two bedrooms and a bathroom, each with their own views of the scenery. The spacious main living area includes a dining room and a kitchen stocked with local organic produce. The focus is drawn to a suspended fireplace where a wall of copper louvers opens to reveal the coastal landscape. Flanked by slinging glass doors, the room expands out to two decks. On one side, guest can take in mountain vistas while the ocean-side platform offers a plunge pool looking out onto Werri Beach. Guests can also wander down to the seaside and enjoy private beach access. Also be sure to check 15 creative modern wooden houses.